With our food samples we are presenting you here the 4,000-year history of the Chinese confections conveying us an exotic atmosphere. 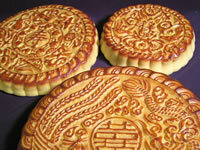 The picture at left shows food samples of the moon cake that is typical of the Chinese confections. Its size, design, and how it is baked differ considerably, depending on each confectioner. Our food samples of the moon cake reproduce and express each of such differences. Shown at left are the pictures of food samples of the chuka manju or Chinese bun that is also typical of the Chinese confections. 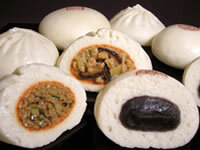 More commonly, it may be called the niku man/buta man or meat/pork bun. Our samples of the niku man/buta man reproduce such a light and dry texture that they even look as if fresh steam or broth were seeping from the inside of them.